The Great Plains of North America supported a sparse population of hunter-gatherers prior to the 1800s. But white settlers brought increasingly intensive agriculture to the region. 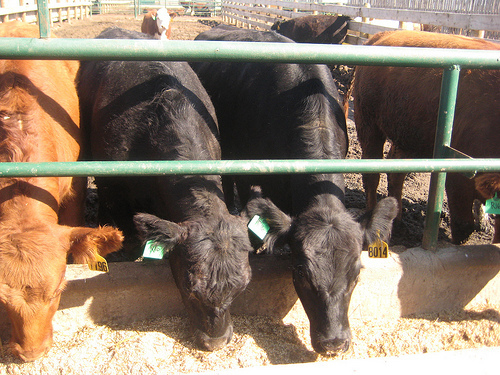 Today, farmers use high-tech methods to grow massive amounts of corn and soybeans, which are converted into animal protein at intensive feedlots, like this one in Okotoks, Alberta. These new agricultural technologies allow the Great Plains to support a much higher human population (in North America and overseas), at the cost of much higher inputs of energy and risks of environmental degradation. The conventional wisdom about agriculture goes something like this: originally, people were hunter-gatherers who lived short, poor lives because they had to scrounge for food from what nature provided. But at some point, someone in the tribe made the discovery that people could plant crops. This led to better food supplies, less work, and more leisure time to develop higher civilization. Geographers now know that this conventional story gets it backwards in many ways (Diamond 1987). Hunting and gathering is a comfortable way of life, while agriculture is often an adaptation of necessity with significant negative ramifications. Figure 1: Modern agriculture and hunter-gatherers. 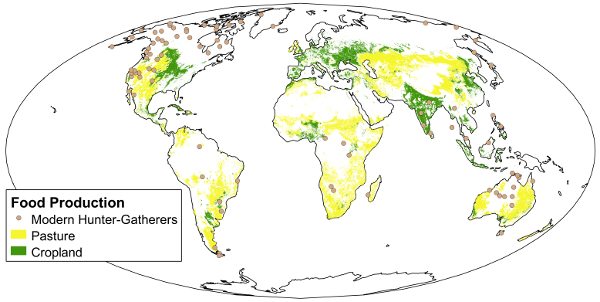 Map shows area used for major agricultural and pastoral production in 2000, and locations of societies that have depended on hunting and gathering for a significant portion of their food in the modern era. To start off, we need to define "agriculture." The conventional story proposes that there is a major leap forward -- sometimes called the "agricultural revolution" or "Neolithic revolution" -- when societies invent agriculture. But it is more accurate to see agriculture as one stage on a continuum of intensification (Boserup 1965, Price and Brown 1985). Intensification refers to the amount of production per unit of land that is extracted for human use. Raising the level of intensification practiced by a society requires increased manipulation of natural processes by humans. We can imagine a scale of intensification running from a wilderness where the only human activity is hikers picking a few berries to eat on their way, to a modern industrial farm that mass-produces corn. Fire is necessary to burn the grass, and form those open forests, in which we find the large forest-kangaroo: the native applies the fire to the grass at certain seasons, in order that a young green crop may subsequently spring up, and so attract and enable him to kill or take the kangaroo with nets (Pyne 2006). Australian Aborigines practiced such a high level of intensification through the use of fire that anthropologist Rhys Jones dubbed them "fire-stick farmers" (Jones 1969). Other hunter-gatherer societies had quite high levels of intensification as well. For example, the Native Americans of the Northwest Coast, such as the Tlingit and Haida, sustained high population levels usually characteristic of agricultural societies because they had found ways to extract large amounts of resources from their environment (Price and Brown 1985). If a society continues to increase its level of intensification, eventually it will find itself practicing types of production that we would recognize as agriculture. Agriculture is generally defined as the deliberate planting and harvesting of crops, and efforts to breed better strains (domestication). Why would a society intensify to the point of agriculture? Because agriculture, like all increases in intensification, increases the output per unit of land (Boserup 1965). Farmers can get more food and other resources -- and hence support more people -- out of a given chunk of land than hunter-gatherers can. Agriculture is thus associated with a boom in population. But if a population declines, a society may de-intensify to hunting and gathering. Take for example the native people of the Amazon basin (Heckenberger et al. 2008). When they were first encountered by European explorers, the explorers assumed that, since agriculture was obviously a better system of production, any society without agriculture must never have learned of it. But in fact the pre-Columbian Amazon was home to massive agricultural civilizations. Huge numbers of these people -- perhaps 90% -- were killed by European diseases, which spread faster than the explorers. With so many people gone, the surviving Amazonians decided they might as well return to hunting and gathering, since they no longer needed the high intensification of agriculture to support their population. Why abandon agriculture as soon as it’s not necessary? Because intensification has three important drawbacks. First, agriculture is more work (Boserup 1965). Contrary to the conventional idea that growing food gave people more leisure time, agriculture requires large investments of time and energy. Anthropologists have studied contemporary hunter-gatherer societies in a wide variety of environments, from the Amazon basin to the Kalahari Desert, and found that they typically spend much less time working than do comparable farming people. For example, when living a hunter-gatherer lifestyle, adult members of the !Kung people of Botswana were found to work an average of 1-3 days per week in order to supply their subsistence (as compared to the standard industrial society 5-day work week, and the 6-7-day work week common among subsistence farmers) (Lee 1979). Keep in mind that there may be significant differences within a society in terms of who does this work. Worldwide, the majority of farm labor is done by women -- but men often control decision-making about how to run the farm. If slave or serf labor is available, a society may practice a higher degree of intensification than it would find worthwhile otherwise (Boserup 1965). Modern farming systems have achieved high levels of intensification by replacing much of the human and animal labor with fossil fuel energy. Second, agriculture is less reliable. Hunter-gatherers make use of a wide variety of resources, which they collect every day or two. If something happens to damage one such resource -- say, a pest outbreak -- the other resources are still available. Farmers, on the other hand, are staking their year's work on a few crops which will have to be harvested at one time. If disaster strikes -- say, a hail storm wipes out their field -- they have just lost everything. Farming societies have developed a variety of mechanisms to minimize and spread out the risk of crop failures, such as diversifying the locations of fields and the strains of a crop grown (Zimmerer 2003). But the fact remains that increased reliability of resource supplies is not usually a product of the transition to agriculture. Third, agriculture is less healthy. As mentioned above, hunter-gatherers use a wide variety of food resources. And amid all the competing health claims about different foods, the most basic piece of nutritional advice remains: eat a variety of things. The transition to agriculture involves focusing on a comparatively small set of plants and animals (the ones that have been successfully domesticated), with negative consequences for human health. For example, archaeologists have found that the Fort Ancient people -- the first agricultural society to live in the Ohio River valley -- had a diet that was 50% to 90% corn (Conard 1988). All that corn rotted and wore down their teeth, and most people died before age 40. Hunter-gatherers are generally taller, healthier, and longer-lived than their (more numerous) farming neighbors. It has only been in the last 200 years that average life expectancies in industrialized countries like those of Europe have exceeded those typical of hunter-gatherers. Furthermore, as we discussed in our chapter on colonialism, the denser settlements supported by agriculture enable the spread of epidemic diseases acquired from domestic animals (Dobson and Carper 1994). The transition from hunting and gathering to agriculture is not the last step in intensification. Agriculture can be practiced at a variety of levels of intensification. Commonly, intensification is accomplished by either increasing the frequency of cropping, increasing the inputs to the farmland, or both (Grigg 1979). Farming a patch of land tends to deplete its fertility. Land that is highly productive after it is first cleared loses its productivity over the course of several harvests. Thus, it is common for agricultural societies to attempt to leave land fallow -- that is, unused -- for significant periods of time in between using it to grow crops. Fallowing allows the land to recover some of its fertility. At the low end of the intensification scale is forest fallow -- in which the land is left fallow for so long that a forest has time to re-grow before the land is used for agriculture again. Greater levels of intensification, in order to produce more food and support more people, may progressively shorten the fallow period. In some parts of the world, farmers produce more than one harvest from the same field within a single year. Here the land doesn't even get a single season of fallow. If fallow periods are reduced, some other means is necessary to restore the fertility of the land. Sometimes this is provided by nature, as in the case of the flooding of the Nile River, which historically deposited a fresh layer of silt on Egyptian fields every year. Other times it requires human work. Systems of crop rotation are patterns of growing a sequence of different crops with complementary nutritional needs on a patch of land. Thus a farmer might grow a nitrogen-depleting crop like corn, then the next season grow a nitrogen-fixing crop like alfalfa. Most commonly, the use of fertilizers is the main way to keep up fertility. In pre-industrial societies, fertilizers included animal manure and cuttings or ashes from plants growing in non-farm areas. In the industrial era, artificial chemical fertilizers have become dominant. This will be discussed below under "The Green Revolution." We have so far mostly thought of intensification as being driven by population growth. But it can also be driven by changes in per-capita consumption. If each person needs more food produced for them, then intensification may be necessary. For example, in some Melanesian societies, farming is a source of prestige as well as food (Brookfield 1973). Men compete to grow and display the largest yams they can. These yams are well in excess of what the household eats, and frequently spoil. Nevertheless, the cultural demand for yam production forces the society to practice a higher level of intensification than they otherwise would. In the developed world, meat consumption is a major source of higher intensification. In most food chains, as much as 90% of the sun's energy is lost at each step of the process. This means that, say, 1000 calories of sunlight will produce 100 calories of plants, which will in turn provide 10 calories for a plant-eating animal, and 1 calorie for the carnivore that eats that animal. This means that growing crops to feed livestock to eat may require 10 times more production than producing plants for a vegetarian diet (Steinfeld et al. 2006). Not all animal agriculture entails this kind of 10-to-1 ratio. Some livestock is more efficient – while cattle are close to 10-to-1, chickens may be as efficient as 2-to-1. Free-range livestock typically eats plants such as grass that humans couldn't eat anyway. But factory-farmed livestock fed on crops like corn and soy do require high levels of intensification. Typically, as a country becomes more wealthy, its people eat more meat. This has meant that the success of development in places like China has created an increasing burden on agricultural systems to supply meat (Pan 2010). Figure 2: Price per pound paid to coffee growers in Colombia. In studies of agriculture, it is common to distinguish between subsistence and commercial agriculture. Subsistence agriculture is agriculture whose primary aim is to supply the needs of the farm household and their immediate kin network. Commercial agriculture is agriculture whose primary aim is to produce goods that can be sold in the market. A commercial corn farmer may sell their corn harvest to a major grain company, then take part of the proceeds to the grocery store and buy a box of corn flakes. Any one farmer may shift back and forth between subsistence and commercial production depending on environmental conditions and the state of the market (Turner and Ali 1996). Commercial agriculture has enabled the growth of a huge population of people not directly involved in farming, as well as giving farmers the ability to purchase a wide variety of goods and services that they wouldn't have been able to make for themselves. But it also has a number of drawbacks. Farmers end up at the mercy of the wider market, where prices may fluctuate widely from year to year due to factors far beyond any farmer's control (see the example of the coffee market in Figure 2). Farmers may find themselves trapped in a cycle of debt, needing to maximize their profits in the current year in order to keep up with loan payments. The search for profitability may lead farms to cut corners, causing periodic food safety scares such as mad cow disease in Britain in the 1980s and salmonella in tomatoes and hot peppers in the US in 2008. Subsistence farmers often value the preservation of high biodiversity in their fields, mingling a variety of crops and useful "weeds," because it provides a rich and varied diet. But commercial farmers find it more profitable to mass-produce a single type of plant -- a practice called monocropping. Finally, commercial farming greatly increases the social distance between farmers and consumers, who interact only through several layers of impersonal market transactions. This means that consumers have little understanding of how food is grown (how many people in the US know what a potato plant looks like?) or what kind of farm practices their purchases support (Esteva 1994). In an earlier chapter, we discussed fears of overpopulation. We also saw that global food production has been rising even faster than population, leading to more abundant food per capita. To understand what happened, we must look into the Green Revolution. The Green Revolution consists of improvements to agriculture brought about by the application of modern scientific methods to the development of new crop varieties and agricultural inputs (Lipton with Longhurst 1989, Borlaug 2000). The technologies of the Green Revolution first made their mark in the United States, but the term is most commonly used in reference to their extension to farmers in developing countries. Taking up Green Revolution technology really involves adopting a whole package of inputs -- improved seeds, new fertilizers, and new pesticides and herbicides, all of which have been designed to work together (Yapa 1996). The improved seeds were created through selective breeding and hybridization. The fertilizers and pesticides are composed of artificial chemicals designed to provide just the nutrients that crops need and to target their main pests and weeds. 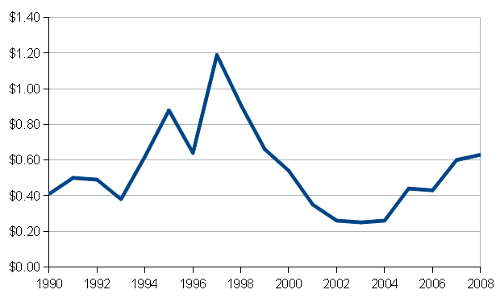 Figure 3: Percent of cropland growing GMOs, 2010. In recent years, the cutting edge of the Green Revolution has been genetically modified organisms. Genetically modified organisms (GMOs) are crops that have been improved not through the slow process of breeding to select for favorable naturally occurring variations, but instead by directly altering the plant's DNA. A variety of improvements have been suggested by scientists working on GMOs, from produce that stays fresh longer to rice fortified with vitamin A to wheat that grows easily in salty soil. So far, the most successful and widely used modifications (see Figure 4) have been 1) the insertion of pesticides into the plant itself (commonly called "Bt cotton," "Bt corn," etc, after the Bacillus thuringenesis microorganism from which the pesticide genes were taken), and 2) resistance to herbicides (such as "Roundup Ready" crops designed to resist the herbicide Roundup). The Green Revolution produced dramatic gains in crop productivity where it was implemented, in some cases doubling or even tripling yields (Lipton with Longhurst 1989, Borlaug 2000). Norman Borlaug -- the agronomist who was the guiding force behind the Green Revolution and one of its most prominent spokespeople -- was widely hailed as a hero who saved millions from starvation, and won the Nobel Peace Prize. Figure 4: Global GMO production broken down by genetically engineered trait, 2009. 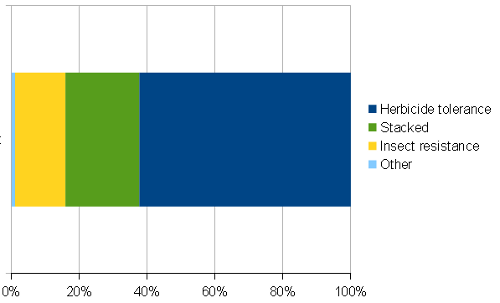 "Stacked" plants have both herbicide tolerance and insect resistance. Yet there are many critics of the Green Revolution. While acknowledging some of the gains in total food supply, these critics argue that the Green Revolution has several critical shortcomings. We can summarize these critiques under the headings of health, environment, and social. The health critiques raise concerns about whether Green Revolution crops are safe to eat. This concern is particularly salient with respect to GMOs. While tests have generally shown GMOs to be safe to eat, critics worry that modified organisms could trigger adverse reactions in people, for example if a person with a peanut allergy ate corn that had a peanut gene spliced into it. There is also concern that work on improving crops has focused on boosting the size and appearance of fruits, kernels, etc, at the expense of making them less nutritious. Finally, health may be impacted by the growing style of Green Revolution crops. The Green Revolution aggressively suppresses any organism in the field that could compete with the main crop. But for many poor farmers, “weeds” are actually an important supplementary source of food (Shiva 2000). It is ironic that adding vitamin A to rice through genetic modification is proposed as a solution, when the vitamin A deficiencies that it will fix were caused in part by a loss of leafy green "weeds" to Green Revolution herbicides. Environmental critiques raise questions about whether Green Revolution agriculture is good for the wider environment. There are several ways in which the environment could be affected. First, successful use of Green Revolution technology often requires increased use of water. This can deplete water supplies in dry areas (and lead to demands for environmentally-disruptive dams to increase the water supply). Pesticides, herbicides, and fertilizers frequently run off the farm into streams, with negative effects on downstream ecosystems. Green Revolution farming can also in some cases pollute and deplete the soil, meaning that the gains in productivity will not be sustainable. There are also concerns about heavy use of pesticides and herbicides leading to the evolution of chemical-resistant super-bugs and super-weeds. Green Revolution farms can further exacerbate the problems of monocropping, converting large areas to farms with very low biodiversity and thus susceptibility to disasters (weather-related, pest infestations, etc). In the case of GMOs, a major worry is that modified genes will spread beyond the field. Wind and insects can carry plant pollen into neighboring non-GMO fields and into non-farm areas. If the plants that receive the pollen cross-breed with the GMOs, the modified gene may become established off-farm, with potentially serious ecological consequences depending on the nature of the gene. Social critiques center on the economic system that farmers become a part of when they adopt Green Revolution technology. Traditional agriculture was largely self-contained. Farmers produced their own inputs by saving seeds from previous harvests to plant next year, by collecting their own natural fertilizers, and by using their own household labor to till the fields. But the improved seeds and the package of chemical inputs that make up the Green Revolution can't be produced on the local farm. They have to be mass-produced by large agribusiness companies and then sold to farmers. Farmers thus become dependent on companies like Monsanto to buy their inputs and sell their products. The contracts that farmers sign with these companies often put small farmers at a disadvantage. Depending on the arrangements made by the farmers, they may then become highly dependent on the international agricultural market -- meaning that global shifts in prices for both inputs and farm products can determine their ability to make ends meet. An emerging trend in agriculture, which is in some ways opposed to but in other ways parallel to the Green Revolution, is the rise of organic agriculture. Organic agriculture is agriculture that avoids the use of "artificial" chemical inputs and genetically modified crops. The organics movement originated as an attempt to avoid the problems arising from the Green Revolution by creating a farming system that works in harmony with the land. This original vision of organic agriculture is reflected, for example, in community supported agriculture programs, which usually practice organic farming. In community supported agriculture, customers buy a "share" or subscription at the beginning of the growing season, then receive a portion of whatever produce the farm manages to grow (Van En 1995). This system is meant to spread the risks of farming between farmers and consumers, create a closer bond between the farmer and consumer, and make organic agriculture more profitable. But as the popularity of organic food has grown, organics have become big business. Major corporations now coordinate the production of organic ingredients all over the world (Franz and Hassler 2010). Certification systems aim to give consumers on the other side of the world confidence that their purchases really were produced organically -- but the certification process can impose high burdens on poor farmers who had been practicing organic (or nearly organic) agriculture all along (Mutersbaugh 2002). Critics frequently question whether organic agriculture can maintain the high yields achieved by the Green Revolution, but recent studies suggest that organic agriculture can be as productive per-acre as Green Revolution agriculture (Hine et al. 2008). Due to the diversity of techniques and differing demands of different crops, there remains much controversy over how well organic farming achieves its goals of reducing its ecological footprint and improving consumer nutrition (Dangour et al. 2009). Bliege Bird, R., D. W. Bird, B. F. Codding, C. H. Parker, and J. H. Jones. 2008. The "fire stick farming" hypothesis: Australian Aboriginal foraging strategies, biodiversity, and anthropogenic fire mosaics. Proceedings of the National Academy of Sciences 105 (39): 14796-14801. Borlaug, Norman. 2000. The Green Revolution revisited and the road ahead. Special 30th Anniversary Lecture, The Norwegian Nobel Institute: Oslo. Boserup, Ester. 1965. The Conditions of Agricultural Growth: The Economics of Agrarian Change Under Population Pressure. New York: Aldine Publishing Company. Brookfield, Harold. 1973. Intensification and disintensification in Pacific agriculture. Pacific Viewpoint 13: 30-48. Conard, Anthony R. 1988. Analysis in dietary reconstruction. In A History of 17 Years of Excavation and Reconstruction: A Chronicle of 12th Century Human Values and the Built Environment, ed. J. Heilman, Malinda Lileas and Chris Turnbow, 112-156. Dayton, OH: Dayton Museum of Natural History. Dangour, Alan, Sakhi Dodhia, Arabella Hayter, Andrea Aikenhead, Elizabeth Allen, Karen Lock, and Ricardo Uauy. 2009. Comparison of composition (nutrients and other substances) of organically and conventionally produced foodstuffs: a systematic review of the available literature. Food Standards Agency (UK). Diamond, Jared. 1987. The worst mistake in the history of the human race. Discover, May. Esteva, Gustavo. 1994. Re-embedding food in agriculture. Culture and Agriculture 48: 2-13. Franz, Martin, and Markus Hassler. 2010. The value of commodity biographies: integrating tribal farmers in India into a global organic agro-food network. Area 42 (1): 25-34. Grigg, David. 1979. Ester Boserup's theory of agrarian change: a critical review. Progress in Human Geography 3 (1): 64-84. Heckenberger, Michael J., J. Christian Russell, Carlos Fausto, Joshua R. Toney, Morgan J. Schmidt, Edithe Pereira, Bruna Franchetto, and Afukaka Kuikuro. 2008. Pre-Columbian urbanism, anthropogenic landscapes, and the future of the Amazon. Science 321 (5893): 1214-1217. Hine, Rachel, Jules Pretty, and Sophia Twarog. 2008. Organic Agriculture and Food Security in Africa. New York: United Nations Conference on Trade and Development and United Nations Environment Programme. James, Clive. 2009. Global Status of Commercialized Biotech/GM Crops: 2009. Ithaca, NY: International Service for the Acquisition of Agri-biotech Applications. James, Clive. 2010. Global Status of Commercialized Biotech/GM Crops: 2010. Ithaca, NY: International Service for the Acquisition of Agri-biotech Applications. Jones, Rhys. 1969. Fire-stick farming. Australian Natural History 16: 224-228. Lee, Richard B. 1979. The !Kung San: Men, Women and Work in a Foraging Society. New York: Cambridge University Press. Lipton, Michael with Richard Longhurst. 1989. New Seeds and Poor People. Baltimore: Johns Hopkins University Press. Mutersbaugh, T. 2002. The number is the beast: a political economy of organic coffee certification and producer unionism. Environment and Planning A 34: 1165-1184. Pan, Chenjung. 2010. China meat demand to soar in coming decade. China Daily, May 7. Price, T. Douglas, and James Allison Brown, eds. 1985. Prehistoric Hunter-Gatherers: The Emergence of Cultural Complexity. Orlando: Academic Press. Pyne, Stephen J. 2006. The Still-Burning Bush. Melbourne: Scribe. Shiva, Vandana. 2000. Stolen Harvest: The Hijacking of the Global Food Supply. Cambridge, MA: South End Press. Steinfeld, Henning, Pierre Gerber, Tom Wassenaar, Vincent Castel, Mauricio Rosales, and Cees de Haan. 2006. Livestock's Long Shadow: Environmental Issues and Options. Rome: Food and Agriculture Organization of the United Nations. Turner, B. L., and A. M. S. Ali. 1996. Induced intensification: agricultural change in Bangladesh with implications for Malthus and Boserup. Proceedings of the National Academy of Sciences 93: 14984-14991. Van En, Robyn. 1995. Eating for your community: a report from the founder of Community Supported Agriculture. In Context, Fall: 29. Yapa, Lakshman. 1996. Improved seeds and constructed scarcity. In Liberation Ecologies: Environment, Development, Social Movements, ed. Richard Peet and Michael Watts, 69-85. London: Routledge. Zimmerer, Karl S. 2003. Environmental zonation and mountain agriculture in Peru and Bolivia: socioenvironmental dynamics of overlapping patchworks and agrobiodiversity conservation. In Political Ecology: An Integrative Approach to Geography and Environment-Development Studies, ed. Karl S. Zimmerer and Thomas J. Bassett, 137-158. New York: Guilford.